Though it would be hard to construct a scary new edition of “Jurassic Park” around them, lobsters look like prehistoric creatures to anyone paying the slightest attention. In fact, by definition, they are prehistoric – covering the shorelines of the New World when the first European settlers started arriving at the beginning of the 17th century. The type of lobster now associated with New England, and specifically with the coast of Maine – with the two large claws so absent from European, South African and other varieties – did NOT come over on the Mayflower. They were waiting, two feet deep on the damp brown sand, to meet the boat. I must confess to a certain nostalgia for lobster, formed even before I started loving to eat the things, and decades before the modern lobster roll turned me into a complete fanatic. My father hailed from New England and each year, in and around New Orleans, he held what he called a clambake for 30-40 friends. There were clams baked, to be sure, but the highlight was always lobster – shipped as freight from Boston, to be picked up by us at a far-flung, down-and-out corner of the New Orleans airport. Sadly, my father didn’t live to see such then-exotic foods become a regular, easy and not wildly expensive part of anybody’s grocery shopping. The foundational way of eating lobster is steamed, when the shells go from purple-green-brown to what must be the world’s brightest red. Enthusiasts sit around a table covered with newspaper pages (giving our chosen profession yet another usefulness), crack open shells and run the sweet meat through melted butter before delivering it to their excited lips. I’m not sure my father ever tasted a lobster roll, or even heard of one, for that matter. Lobster rolls are a 20th century invention, which makes them “brand new” in the centuries-old world view of some of America’s oldest existing settlements. There is a bit of a tussle over where lobster rolls were invented, with both major contenders having some claim upon the truth. 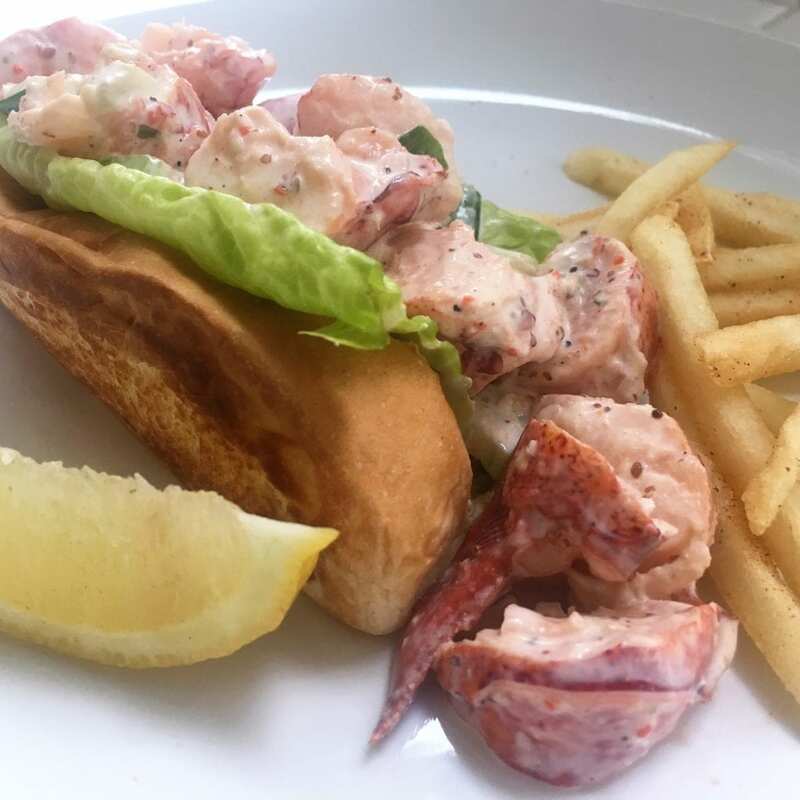 A restaurant in Connecticut (yes, officially part of New England, not New York) is persuasive about serving the first thing called a lobster roll. Yet, by most accounts, this was a bun or roll topped with lobster in the same old melted butter. What Maine, apparently, brought to the party – and I for one am so glad it did – was the notion of a lobster salad. Thus the lobster meat is not in butter but mayo and a small amount of coarse-ground tangy-sweet mustard, kissed with lemon juice and a bit of crunch from chopped celery. The idea is a lot like common chicken salad, shrimp salad, even basic potato or egg salad. But with lobster, its meat contributing red highlights beneath the white, everything about this salad is different somehow. All this invention took place in the first half of the 20th century, allowing lobster rolls to slowly become a New England classic in the years after my father left for the Deep South. For decades, they were a dish you had to travel to New England to taste. Yet thanks to a number of New England-themed restaurant chains – Legal Seafood probably the best-known, but also Coastal Flats – food lovers elsewhere have started getting the lobster roll craving. Today there are several lobster roll food trucks traveling the highways and byways of Texas. We’ve enjoyed the long hard-to-find delicacy from one truck in a high-tech office park in Austin, as well as from another truck based in San Antonio. The latter had the promotional advantage of being funded nationally on TV’s Shark Tank. Lobster rolls are clearly a food whose ship, literally and figuratively, has come in. The availability of live lobsters from a tank in most supermarkets is a blessing and a half, as is the fact that most seafood counters are willing and able to steam any lobster you choose to purchase. That service makes lobster rolls like these an easy treat indeed. 4 (1-pound) cooked lobsters, or 1 1/2 pounds lobster meat. 2 inner celery stalks and leaves, finely chopped. Remove the meat from the lobsters, chopping any large chunks into bite-size pieces. In a bowl, combine the lobster meat, mayonnaise, mustard, lemon juice, celery, parsley, and salt and pepper to taste. Brush cut sides of the rolls with melted butter and toast in a pan. Fill with the lobster salad. Serves 4.